Pope Francis welcomed thousands of young Catholics gathered for World Youth Day rally. 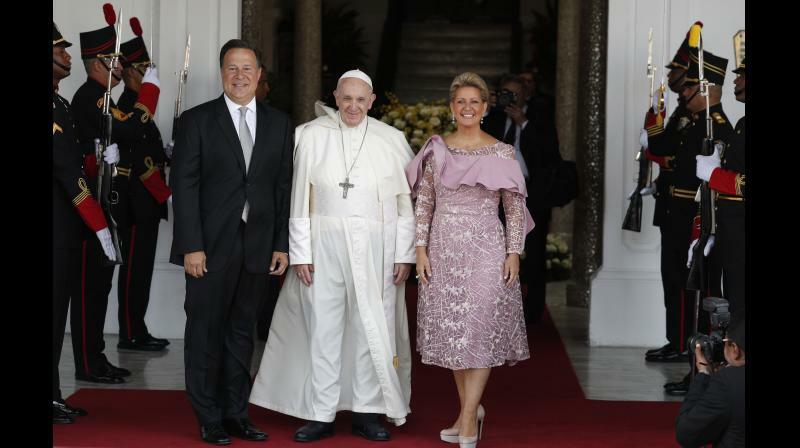 Panama City: Pope Francis insisted Thursday that public officials live simply, honestly and transparently as he opened a visit to Central America that has been rife with corruption scandals and is now coping with political upheaval in nearby Venezuela. Francis stuck to his script in Panama, celebrating the country's location as the bridge between oceans and cultures and holding up the region's newest saint, slain Salvadoran Archbishop Oscar Romero, as a model for a humble church that accompanies the poor. He welcomed tens of thousands of young people to World Youth Day, the Catholic Church's big youth rally, and urged them to be builders of bridges of encounter, not "builders of walls that sow fear and look to divide and box people in," a clear reference to the proposed US-Mexico border wall. Francis' visit is taking place against the backdrop of both the turmoil in Venezuela and the ongoing migrant standoff in the United States, where the government is partly shut down over President Donald Trump's demand for congressional funding for a wall at the US-Mexico border. History's first Latin American pope, who was born to Italian immigrants to Argentina, Pope Francis has made the plight of migrants a cornerstone of his papacy and denounced how fear of migrants was driving populist and nationalist sentiment across the globe.